Why us? And how do we meet YOUR need? It’s hard enough to page through hundreds of pages in your Textbook and not get confused, even depressed at the sheer volume of work. But what if there was a way to reduce the 100’s of pages to a mere fraction. 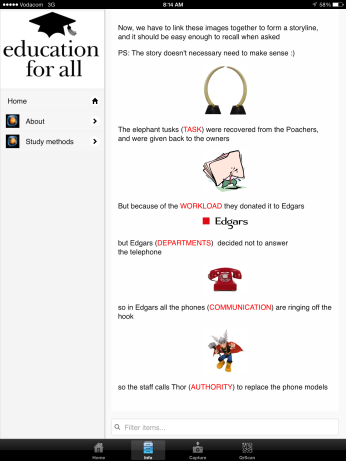 What if there was a way to Extract only the relevant and important facts? This section in the process is probably the most important. If you can’t remember your Keyword, or can’t make the Association with the full sentence, then you might as well skip to the next Exam question. 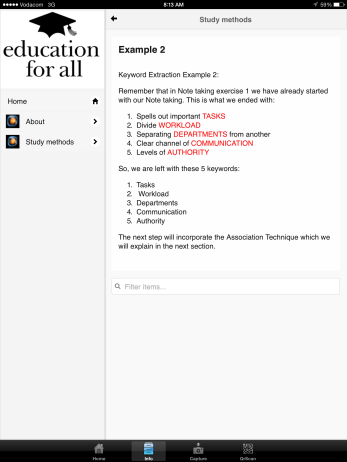 Keyword extraction is a vital part of Note taking and is the key to successful learning. 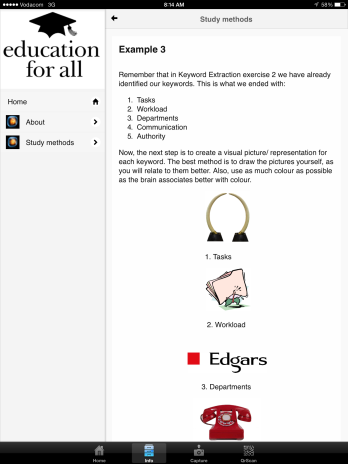 Keywords encapsulate information and at a signal from the brain, release it. Next we need to take out keywords, create a visual representation/ picture for each, to enhance our chances of recalling the information. Associating your keyword is to take two visual images and link them together. Like it? Why not download this FREE App from one of the stores below?